When I first came home from the hospital I couldn’t do much without help. And I got tired really easily. The pain medicine I was on didn’t help much either, it made me so dizzy and out of it I could hardly focus on a movie, let alone do sewing projects like I wanted to. But I still needed something to keep my hands somewhat busy, so I decided to pull out some crocheting to do. I have an inordinate amount of yarn just lying around and I wanted a project that I could finish quickly and easily that didn’t need a lot of keeping track of what stitch I was on in the pattern (grief seems to completely destroy your attention span). And while looking for something easy like that to work on, it hit me: I should make baby hats! When the nurse brought Enoch to my room after my c-section she had him all wrapped up in a tiny blanket and under that he was wearing tiny clothes. It didn’t matter that he was 4 months early and was 10 inches long and weighed no more than 15 ounces, she had somehow found him clothes. Mind you they were nothing fancy, but the gesture touched my heart deeply. She knew that he was a person, and that he mattered, and that people wear clothes (they even let us keep the little outfit). The clothes in question were a tiny hat and something akin to an oversized sock that I refer to as a “preemie sleeping bag”. They were knitted in matching yarn, and had been donated by a local woman for use in situations like mine. And so in thinking about how touched I was to have my son brought to me in clothes I set about to make hats and preemie sleeping bags to donate to the local hospital. I ended up finding a pattern in crochet that was perfect, and you can get it for free from here: baby hats. 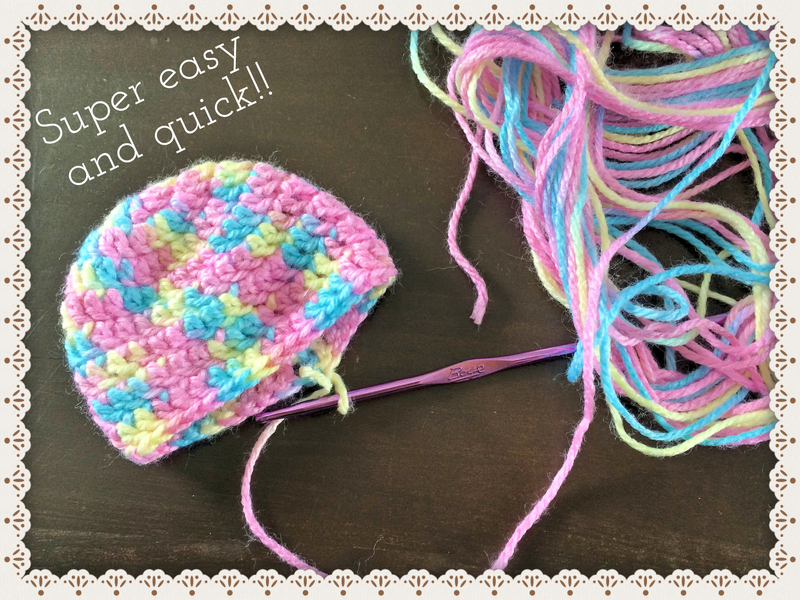 The pattern can be easily scaled up or down based on gauge, weight of yarn, or size desired, by doing little more than adding or subtracting the number of increase rows you crochet and using an appropriate size hook for the yarn you have available to you. And if you want to make a preemie sleeping bag, all you have to do is make it slightly wider than your average hat (add an extra increase row or two) and keep adding rows until it’s the length you need. I make mine about 12 inches long-I figure they can fold over any extra at the top if needed. Last week I brought a gallon size ziplock bag of them (probably about 2 dozen hats) to the maternity ward where Enoch was born. They really appreciated it, and they hardly recognized me: they said I was looking a lot better and healthier. It was really good to do something nice for others and the repetition of doing the same crochet stitch over and over again was very therapeutic! P.S. Here are a couple pictures of hat number 27-ish (honestly I’ve stopped counting). 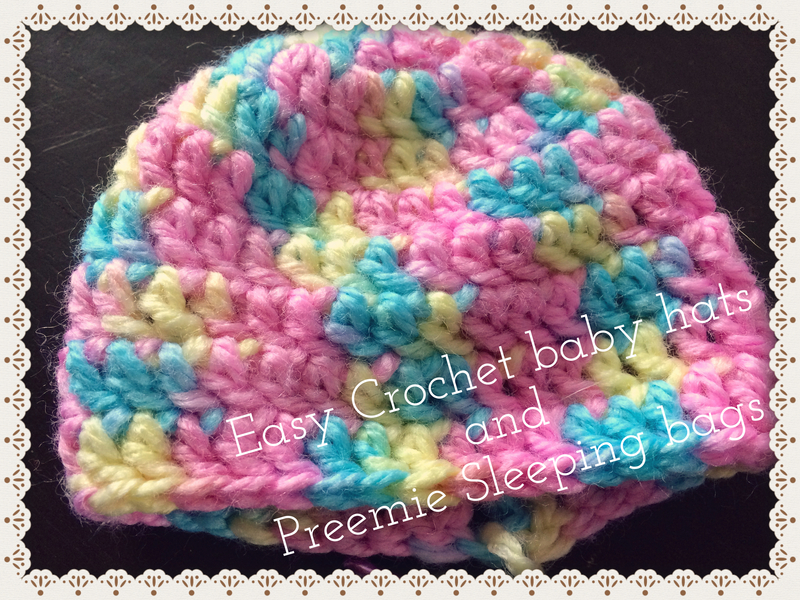 For this particular hat I used a skein of Bernat Softee Baby in the color “Pyjama Party” and I used a US size G crochet hook because this yarn is a #3 “light” weight yarn.